SYRACUSE, NY (WRVO) – Lt. Gov. Kathy Hochul has criss-crossed the state over the last several weeks sounding the alarm that the state’s two percent tax cap, which limits local government and school district spending, is more important now than ever and should be made permanent by the state legislature. “This year because of the uncertainty out of Washington, and knowing that our taxpayers are taking it on the chin because of the loss of the state and local tax deduction (SALT), we think we need to come out even stronger and enshrine this two-percent tax cap and make it permanent,” said Hochul. 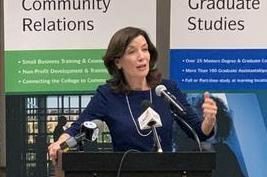 During stops in Syracuse, Watertown and Oswego Wednesday, Hochul asked local leaders to intensify lobbying efforts on the issue. She said while it can be a challenge for local governments to live within the cap, it’s these local taxes that produce the largest tax burden for residents, who live in what some reports say is the highest taxed state in the nation. “I assure you that we would be much higher if we didn’t have this tax cap. In fact, this tax cap has resulted in $25 billion in more money in the pockets of New Yorkers, $1.2 billion right here in Central New York and people appreciate that,” she said. Gov. Cuomo has promised he won’t signed a state budget, which is due April 1, unless it includes a permanent tax cap.